While Australia slept, John Salisbury, a true gentleman activist from Melbourne, rose daily to the moral occasion of walking the tough 300 kilometers from the Sydney Opera House to Canberra, the seat of the Australian parliament. 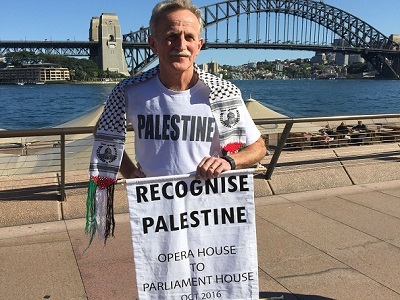 There, on October 11, he presented to Maria Vamvakinou MP, head of Parliamentary Friends of Palestine, petitions to ask the Australian government to recognize Palestine. Postcards for the Prime Minister from citi-zens reminding the government, having ratified the Arms Trade Treaty, to end arms trade with Israel were received by Greens Senator Lee Rhiannon. So, can the generous spirit of one man change the Turnbull government’s servility to Isra-el? – a servility that abrogates its responsibility under international law to protect and up-hold Palestinian political and human rights. “The voting pattern [in the UN] of Australia sends the message that Australia is completely relaxed about the degradation of Palestinian life,” said Bob Carr, former Foreign Minister. On November 29 2012, Australia abstained from the UN General Assembly resolution 67/19 upgrading Palestine to non-member observer state status in the United Nations. 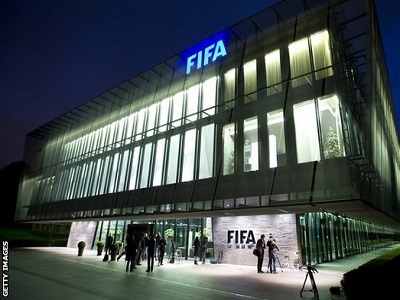 It was adopted by 138 nations. On September 10 2015, Australia voted against the UN resolution on raising the flags at the UN, of non-member observer States, that now included Palestine. It was adopted by 119 in favor to 8 against. In 2014, Australia’s foreign minister, Julie Bishop, ever obsequious to Israel, inanely said that the international community should refrain from calling settlements illegal under in-ternational law despite knowing full well that UN resolutions 446 and 465 argue that the Fourth Geneva Convention applies to occupied West Bank and Gaza and therefore the set-tlements are illegal. Later in 2014, Julie Bishop, with fatuous foot-in-mouth panache, decreed “The Australian government will not refer to East Jerusalem as “occupied, territory”. The Times of Israel reported that Attorney General George Brandis explained Australian Foreign Minister Ju-lie Bishop’s position that using the word “occupied” was judgmental and does not con-tribute to the dialogue about the contested area. “The description of East Jerusalem as ‘occupied’ East Jerusalem is a term freighted with pejorative implications which is neither appropriate nor useful,” Brandis said.’ What a witless demonstration of casuistry! Speaking of Bishop, Salisbury also presented Arms Trade Treaty (ATT) postcards from decent Australians who cannot comprehend or tolerate Israel’s war mongering against Pal-estinian children and their families whom Israel has trapped in Gaza with no escape. Article 6: 3. A State Party shall not authorize any transfer of conventional arms cov-ered under Article 2 (1) or of items covered under Article 3 or Article 4, if it has knowledge at the time of authorization that the arms or items would be used in the commission of genocide, crimes against humanity, grave breaches of the Geneva Conventions of 1949, attacks directed against civilian objects or civilians protected as such, or other war crimes as defined by international agreements to which it is a Party. Israel is a prime target for ATT sanctions. The alarming Israeli documentary, The Lab by Yotam Feldman, reveals that Israel is a military economy that has locked 1.6 million (now 2 millions) Palestinians in its military laboratory cage where weaponry is battle-tested on Gaza. Billions of international dollars from western defense departments, including Aus-tralian, fuel the demand and validate Israeli atrocities. “A key player in the military industries told me that the operational testing in Gaza of El-bit’s BMS (Battle Management System – a special internet-like system for ground forces), a huge project worth $1 billion, has allowed Elbit to raise its price in a deal signed a year later with Australia…A salesman for the IAI (Israel Aerospace Industries) told me that as-sassinations and operations in Gaza bring about an increase of tens of percentage points in company sales”. 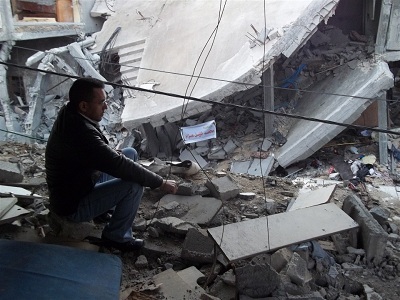 Gaza is a cemetery for over a thousand war-slaughtered children, a sealed death camp for 800,000 maimed and traumatized surviving children waiting, waiting, waiting for the next inevitable Israeli pestilence of bombs and sheer terror. Waiting like little Hamza Mus’ab Almadani, 3, of Khan Younis, Gaza. The agonizing pain and trauma from being hit on July 25 2014 by an illegal white phosphorous bomb, turned a once happy boisterous child, mute- a common symptom of trauma among Gaza’s chil-dren terrified by Israel’s relentless and tumultuous bombardments watched on distant hillsides by cheering Israelis in front-row seats. Elbit for training, supply, installation of Hornet data recorders, tactical computer and components for LHD landing craft weapon systems (RWS), Battle Management system supplies, G Wagon Kit, BGC3 System ; with Israel Aerospace Industries ( IAI) for the Heron Remotely Piloted Aircraft ( RPA) used by Australia in Afghanistan and now Woomera with 5 RAAF personnel trained in Israel, and Rafael Advanced Defense Systems supplied the Australian navy frigates and patrol boats with the Typhoon close-in weapons systems. Elbit Hermes drones were one of the two main un-piloted aircraft used to attack people in Gaza during Israel’s 2009 Operation Cast Lead attack which killed over 1,400 Palestinians. “The Hermes has an array of optical, infra-red, and laser sensors that allow the operator to identify and track targets as well as to guide munitions in flight,” reported Human Rights Watch. Furthermore, HRW reports that the Hermes drone is equipped with a camera system which allows the drone pilot to see if a person is armed or if they are a child or an adult and can be diverted up to the last second. This means that Israel’s drone pilots and their commanders would have known that they were targeting civilians and are culpable for war crimes carried out by Elbit drones. HRW called for the disclosure of camera footage shot by Hermes drones, to assist in the investi-gation of war crimes. Needless to say, this request was not granted. On October 8, US secretary of state, John Kerry defining hits on “hospitals and medical facilities and women and children” as war crimes was arrogantly oblivious to the irony of the US record of such hits in Afghanistan and Israel’s in Gaza. No wonder neither the US and Israel have signed up to the ATT. Perhaps, it is possible for one dogged (Salisbury made the same walk in 2015) honorable man, carrying the good will of the people for the recognition of Palestine and arms sanc-tions against Israel according to international law, to make the proverbial difference. – Dr. Vacy Vlazna is Coordinator of Justice for Palestine Matters and editor of a volume of Pales-tinian poetry, I remember my name. She was Human Rights Advisor to the GAM team in the sec-ond round of the Acheh peace talks, Helsinki, February 2005 then withdrew on principle. Vacy was convener of Australia East Timor Association and coordinator of the East Timor Justice Lobby as well as serving in East Timor with UNAMET and UNTAET from 1999-2001. She contributed this article to PalestineChronicle.com.